Many customers at our Wild Birds Unlimited shop are reporting that Eastern Bluebirds are visiting their yards this winter for the first time ever. Most are surprised that bluebirds are around in the middle of a bad winter, but upon questioning we find that their bluebirds are enjoying the fruit-bearing trees or shrubs in their backyard habitat, or that the bluebirds have found some of their birdfood offerings particularly appealing. Bluebirds are insectivores during the summer months and will relish finding live insects to feast upon in winter. Won't they freeze, you ask? Yes, when left uneaten. But once the bluebirds find that you're offering live insects, they will NOT go uneaten!! They will always prefer live mealworms over dried (dead) mealworms. Bark Butter comes in a variety of forms. Bark Butter in a tub is a spreadable suet that bluebirds seem to crave. It is easy for them to eat, since they are able to just pick off small portions. Bark Butter Bits are Bark Butter in nugget form. Same great ingredients in a small round nugget that bluebirds can easily pick out and eat. Just put out a handful in any cup-type or tray feeder. We usually don't think of bluebirds as seed eaters, but they really enjoy our shell-less No-Mess Blends. I think the key is that No-Mess has no shells, making it easy for bluebirds whose beaks are just not made for opening shells. Consider No-Mess NM (No Millet, just sunflower chips, peanuts, tree nuts) or No-Mess Plus (sunflower chips, bark butter bits, tree nuts, peanuts). Bluebirds seem to love cylinders and Stackables, which are long-lasting (great for winter feeding!) compressed seed products, because they have no shells. They will just pick at them to get the seed they want. Bluebirds are year-round birds in this portion of upstate New York. So even if you don't have the preferred open habitat for bluebird nesting in the summer, you still might find them enjoying a heated birdbath and the easy pickins' at your birdfeeding station if you put out the right foods! Do you have winter bluebirds? Let me know where you are and what winter bluebirds are eating in your yard. Thanks to staff member Jane Riccardo for contributing to this post. We're lucky to have Purple Finches in our yard all summer, and the last few years have been banner years for them. They'll move on soon from my yard, but that means that other folks in eastern New York might be seeing them soon. While Purple Finches eat some black oil sunflower as well as niger seed, at our house they prefer straight safflower seed. The advantage to this is that squirrels don't typically bother safflower seed so you have more flexibility in where you locate their feeders. We find that Purple Finches, like goldfinches, seem to prefer a feeding area that is mostly just for them. For the Purple Finches, we place three feeders filled with safflower seed under the hemlock tree on the shady west side of the house. It's a cozy location and is very wooded with coniferous trees. We have another feeder filled with safflower seed in the wide open of the front yard, but they seem to prefer their special feeding area and only go to the front yard feeders for overflow. I describe finches as "sitters" - they will sit at a feeder and open seed after seed right there on the perch, unlike chickadees, titmice, and nuthatches who take a seed and go. This means you could have many Purple Finches on the feeder at one time. So give them many perches on multiple feeders and you will open up the possibility of seeing lots of Purple Finches at once. In the area of our yard that is dominated by Purple Finches, the feeders offer over 20 perches, and sometimes there are still birds waiting in the nearby trees for a perch to open up. Sometimes a dominant Purple Finch will force another one off the feeder, so give them lots of perches! As always, keep your birdfeeders clean, make sure the seed is fresh, and enjoy the beautiful Purple Finch! Our locally-made Suet Log Bird Feeder is the most popular suet feeder in our Wild Birds Unlimited shop. Chickadees, nuthatches, titmice, and jays readily use it, but woodpeckers seem to especially prefer it because its length lets them perch upright on it. The natural wood is also appealing to birds and bird-lovers alike. Here's a few tips to help you and your birds enjoy this great bird feeder. It is important that the suet plug fits snugly within the hole so it doesn't just get pushed out the other side by the birds. This is easily achieved when the suet is just a little soft. Unwrap the suet and press your thumb into it. If the suet is hard and doesn't give a little to some pressure, soften it SLIGHTLY in the microwave. I start with about 20 seconds at 40% power, though microwaves vary. Do the thumb test again, if it hasn't softened enough, give it a few more seconds. Don't overdo it - it will melt! You just want the suet soft enough that your thumb print shows - not so soft that your thumb goes right through the plug! Again, you want the suet to completely fill the holes and be snug against the entire interior of the hole. If you don't do this, the plug could get pushed out the other side, especially in cold weather. Use the heals of your hands or your fingers to push the suet snugly into the holes. Our woodpeckers especially seem to prefer this feeder when hanging right in a tree. To keep squirrels from eating all the suet, use a hot pepper suet. It contains capsaicin which keeps squirrels from eating it, but the birds don't taste the hot and readily eat it. This is a good practice you should follow every time you handle a bird feeder, but especially after handling hot pepper suet. It will keep your counters clean and catch the crumbs. Plus you get to eat a pizza! I hope these tips help you be more successful with your suet log bird feeder. The birds love it and so will you! Here's just some of the birds that have visited our, or our customers', Suet Log Bird Feeder. One of the first accessories that many customers add to their Wild Birds Unlimited Advanced Pole System® (APS) Set-up is a Decorative Branch. Here's my Top 4 ways to use the decorative branch on your APS set-up. The decorative branch is a great location for a lightweight birdfeeder like our Bark Butter Stick feeder (pictured above with Hairy Woodpecker), a small mesh peanut feeder, or a seed bell. I've had good luck with all these feeders on my decorative perch. From early spring and throughout the summer, hang nesting material like alpaca fiber, wool, pet hair, short yarn strands, or other nesting material. I've had Black-capped Chickadees, Tufted Titmice, and Purple Finches use nesting material that I've provided to line their nests. It's a great way to observe a nesting behavior that you may not have seen before! Cut a medium to large sized apple, pear, or orange in half and place the halves in the open "leaves". Fruit-loving birds like orioles, American Robins, Gray Catbirds, waxwings, Northern Mockingbirds, or Eastern Towhees might just accept your sweet offering. Birds will perch on the branch to open seeds. They'll light on it as an approach to the feeders. Or if you're lucky, they'll feed their young on it, like the American Goldfinches and Rose-breasted Grosbeaks have done in my yard! Add a Decorative Branch to your APS set-up soon - it's easy to do and so much to enjoy watching your birds on it! One of the first questions we ask customers who come in our shop hoping to attract orioles is whether they've seen them in their area before. If they answer "no", we usually suggest they watch for them and pick up a feeder when they know they have the proper habitat for orioles. If they say "yes, I saw them last year" or "yes, I've seen their unmistakable pendulous nest in a nearby tree", we then encourage them to try an oriole feeder. If you can answer "yes" to my question, here are my top 5 tips for attracting orioles into your yard. 1) Have the oriole feeder up and ready BEFORE they arrive. In our area of east central New York state, that means putting out an oriole feeder near the beginning of May. 2) Hang the feeder so it's visible from the treetops. Orioles are treetop birds, so make sure you hang your oriole feeder where they would be most likely to see it from their perches at the top of deciduous trees. Oranges are the easiest food to offer orioles at a birdfeeder. Cut them in half so the insides are up. You can also offer grape jelly. Orioles have a sweet tooth and will eat mounds of grape jelly daily. Don't make the jelly pile too deep, just in case some other smaller bird with a sweet tooth gets into it. Orioles eat insects, especially tent caterpillars, and will eat live mealworms offered in a birdfeeder. Orioles will lap up nectar, but because of the size of their bill, it needs to be in a specialty oriole feeder that has ports bigger than those on a hummingbird feeder. The nectar concentration is weaker too, 8-to-1 instead of the hummingbird nectar ratio of 4-to-1. Check out the nectar recipe page on our website. 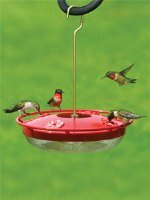 At our Wild Birds Unlimited shop, we have a number of oriole feeders for providing these foods. 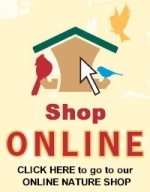 Or check out our online store. So, get those feeders out and watch for that stunning flash of orange and black of the beautiful male oriole! Image 3 - Mary Foss Bullard, WBU-Saratoga's Fan PIC of the YEAR 2012.